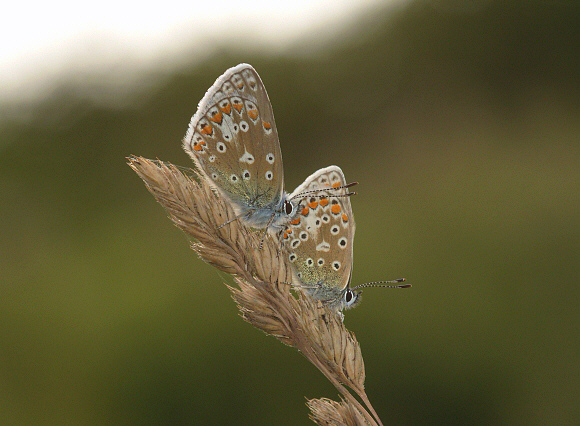 Despite it's name, the Common Blue can no longer be considered a common butterfly. 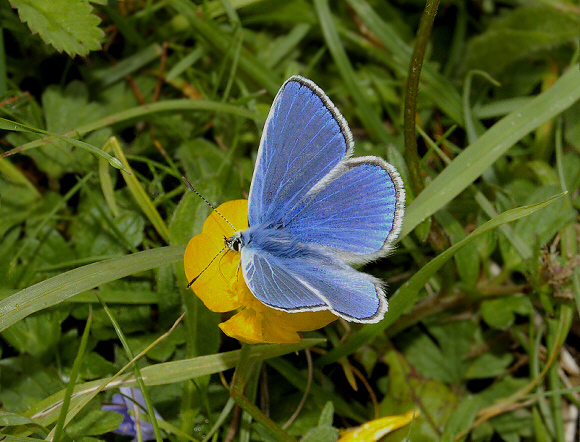 It still remains the most widespread "blue" in Britain, but many colonies in marginal habitats such as woodland rides and farmland have declined or been lost. The species still occurs in moderate numbers on chalk or limestone grasslands, but even in these habitats most colonies nowadays comprise of no more than a few dozen individuals. Males are very consistent in appearance, the uppersides being violet-blue with plain white fringes. 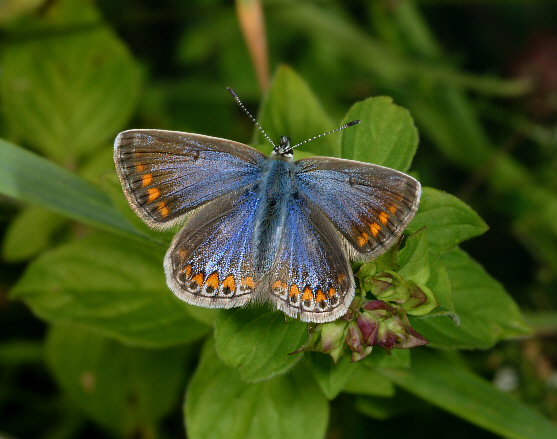 Females vary considerably - they always have orange submarginal lunules, but some are almost devoid of blue and strongly resemble the Brown Argus, while others are heavily dusted with blue scales. The magnificent Scottish race is known as marsicolore - its upperside is almost entirely deep violet blue, and the orange lunules are much enlarged. 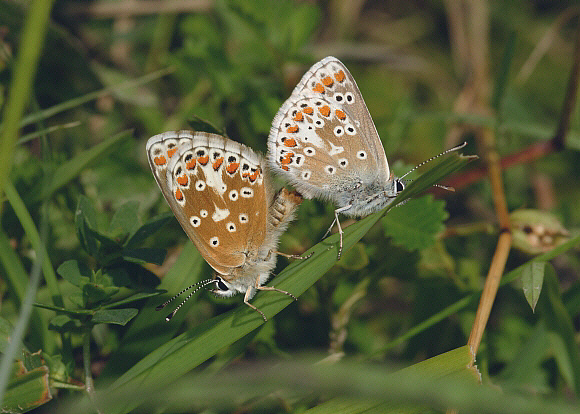 The undersides of both sexes of Common Blue are marked with a pattern of white-ringed black spots and orange crescents. Sometimes aberrant forms can be found in which the black spots are elongated into a series of short bars. Other rare forms occur in which the spots are reduced in size, or entirely absent. In all forms the male has a greyish ground colour with bluish scales around the base of the wings. Females instead have greenish scales at the wing bases, and a pale brown ground colour. 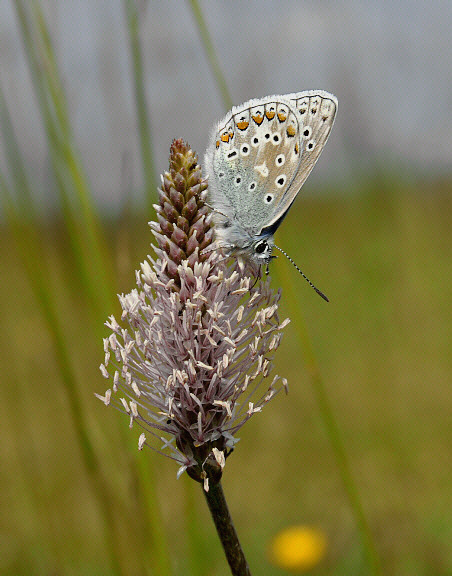 All butterflies in the subfamily Polyommatinae have undersides patterned with black spots, including several European species in the genera Plebejus, Polyommatus and Agrodiaetus. Several of these can be confused with the Common Blue. The number and arrangement of the spots is different in each species however, so close examination of the markings and the use of a well illustrated field guide will enable the various species to be differentiated. 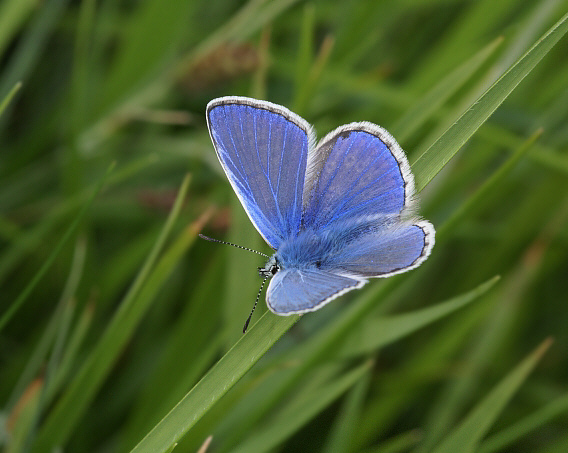 The Common Blue is found throughout Europe, from the extreme north of Scandinavia to the smallest islands of the Mediterranean. Beyond Europe, it's range extends from the Middle East across temperate Asia to northern China. It also occurs in north Africa and the Canary Islands. The butterfly is found throughout England, Scotland and Wales at sites where bird's foot trefoil grows in profusion. It is most abundant on chalk or limestone grassland but also occurs in lesser numbers in woodland clearings, meadows, heathlands, sand dunes, along railway embankments, riverbanks and undercliffs. Numbers are usually highest on south facing hillsides, but populations at these sites are prone to crash in hot dry summers, resulting in poor numbers the following spring. 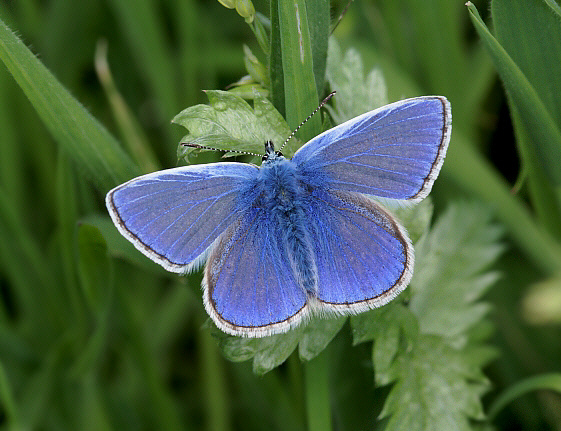 In Europe the Common Blue occurs in almost all habitats - I have found it on mountains at altitudes up to 2700m, and in numerous other habitats including arid scrubland, glades in pinewoods, and on freshwater marshland. In southern Britain there are usually 2 generations per year. The first brood emerges in May and flies until mid June. The second brood emerges in late July or early August and remains on the wing until mid September or sometimes into early October. There may be a partial third brood at certain particularly warm sites. In the north of Britain there is often just a single brood, but this depends very much upon locality and weather conditions. The circular, flattened white eggs are usually laid on the upper surface of terminal leaves of bird's foot trefoil Lotus corniculatus, but greater bird's foot trefoil Lotus uliginosus, restharrow Ononis repens, black medick Medicago lupulina and other leguminous herbs are also used. The larvae are pale green in colour, and feed diurnally. Like most Lycaenid species they are often attended by ants, which milk them for sugary secretions. The larvae in exchange are protected by the ants from predatory insects. The relationship is not symbiotic however - captive larvae prevented from making contact with ants survive well and produce healthy adult butterflies. Larvae of the 1st brood feed up quickly to produce butterflies in late summer. Those of the 2nd & 3rd broods ( where they occur ) hibernate when quite small, reawakening in March to resume feeding. The chrysalis is pale green, with the wing cases tinged with buff. The shed larval skin remains attached to the tip of the abdomen. Ants are attracted to the newly formed chrysalis ( probably by pheromones ) and quickly cover it with particles of soil and leaf litter. The pupal stage lasts for about 2 weeks. In weak sunlit conditions males often bask on low herbage, with wings held half open. In overcast but warm conditions they sometimes bask with wings fully outspread. When the weather is warm and sunny they fly actively from flower to flower, nectaring in spring at plants including bird's foot trefoil, buttercup, daisy, black medick, hop trefoil, hoary plantain, speedwell, heath milkwort, field forget-me-not and comfrey. Summer brood butterflies particularly favour fleabane, ox-eye daisy and marjoram. When the sexes meet copulation occurs immediately without any form of courtship ritual. Mated pairs often sit in prominent positions on grass-heads or on the flowerheads of plantain. Both sexes roost overnight on grass heads, facing head-downwards, often in groups of up to 5 individuals. Roosting at the top of the grasses is probably an effective survival strategy, keeping them out of reach of mice and other nocturnal predators.